CHESHIRE, Conn. – Seventeen high school athletic programs have been selected as CIAC Michaels Achievement Cup exemplary programs recognizing their outstanding achievement as overall athletics programs for the 2013-14 academic year. Berlin, Bloomfield, Bunnell, Cheshire, East Catholic, Fairfield Ludlowe, Gilbert, Haddam-Killingworth, Joel Barlow, Lyman Memorial, Ledyard, Lyme-Old Lyme, Newtown, Simsbury, Staples, Weston, and Wilton are the schools honored as exemplary athletic programs. The 17 schools represent all six classifications and are selected based on achievement in seven distinct areas which are sportsmanship, participation, athletic scholarship, athletic personnel, equity, chemical free initiatives and athletic achievement. All CIAC member schools are asked to submit information via a survey for consideration for recognition, and a mathematical formula is used to analyze the data. The CIAC Michaels Achievement Cup Committee reviews the statistical data and discusses the merits of each potential award recipient based on a comparison of its written criteria and CIAC compliance. Three of the programs were recognized as Michaels Achievement Cup exemplary programs for the first time since the CIAC began administration of the program for the 2008-09 season. Another six honorees are receiving the honor for the second time during that time frame. Since the CIAC began its administration of the program, a total of 48 schools have been recognized as exemplary programs. The 17 schools will be honored at the CIAC Sportsmanship Conference at the AquaTurf in Southington on November 20. The Michaels Achievement Cup program was created in the early 1980s as the brainchild of Roy Michaels, the owner of Michaels Jewelry, in an effort to recognize outstanding athletic programs. 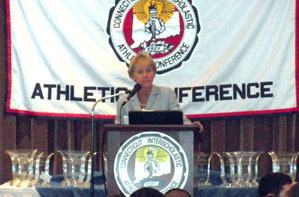 The program recognized yearly winners since that time, and then in 2008 transitioned directly to CIAC administration of the program.